It is not difficult to see that David Cameron does not respect his elders, when we see how he treats experienced colleagues in the House of Commons (2) such as Dennis Skinner. He despises them, just as he does the young, the sick and the disabled. He has no respect for anyone it seems, valuing the financial sector for his own gain and those of his friends, – I think we can guess who. David Cameron tried to shake off the Conservatives’ “Nasty Party” image, but he forgot that actions speak louder than words. The ACTIONS of this Liberal-Democrat-supported-Conservative-Government speak very LOUDLY indeed. State Pension Age extended – women not forewarned. In November 2011 the Coalition government announced the intention to further increase the state pension age. (13) State Pension age will now increase to 67 between 2026 and 2028. Meanwhile changes have been made to others nearer to retirement age, and these changes have been made at short notice. The government said it took this decision because of increasing life expectancy, to help manage the cost of State Pensions. There is no consideration as to the nature of the employment or as to whether jobs would be available with rising unemployment or suitable as people become less physically able, and perhaps slower mentally due to ageing. Working later is absolutely fine, and in fact desirable for many people are who are fit, and wish to continue work, but these policies are ill-thought out. Recent attacks on public sector pensions show no understanding of the consequences. Public sector workers, often on lower pay than some in the private sector after years of study are expected to pay greater contributions to their pensions and to retire later. Many workers face an impossible task, to continue working in physically and mentally demanding jobs. If people wish to retire at 55, and young people are fit and qualified to take over, then it is reasonable that they should have that option. Why is working longer being inflicted on our caring, hard-working public sector? they are in hospitals or schools or anywhere else – cannot work at the kind of pace we are asked to work at until the age of 68”. The government hopes that the unpopularity of public sector strikes will be divisive. In fact there has been wide scale support for public workers. Now, the government is pursuing whole-scale privatisation seeking to silence people through fear. The government seeks strengthen its case, by weakening the opposition by dividing public from private. ( See Think Left’s “Public and Private Workers, Unite “) (7) Working for very low pay is the plight for many in the private sector. Often these workers have no effective trade unions to state their case, due to the attacks of the trade unionism by Margaret Thatcher. Neoliberalism has meant that speculators have been predatory without any conscience. They seek to profit at others expense and there are many people who sensibly invested in private pensions only to have found on retirement that their pensions are half what they expected. Gambling with the income and welfare of our elderly population is callous. All workers are entitled to and deserve a decent pension, and workers need to fight this together, and not allow this government to divide and rule. Whether public or private, working people pay for their pensions while working, and there is an expectation, a contract that this is investment for the future. This is a contract which they have honoured and paid for. The financial sector must honour the contract too. A fundamental pension contract should exist within any society. This is that one generation, the older one, will through its own efforts create capital assets and infrastructure in both the state and private sectors which the following younger generation can use in the course of their work. In exchange for their subsequent use of these assets for their own benefit that succeeding younger generation will, in effect, meet the income needs of the older generation when they are in retirement. Unless this fundamental compact that underpins all pensions is honoured any pension system will fail. Community Services for the elderly have been cut by over a billion pounds since the Coaltion government came to power.. These cuts are not only heartless, but a false economy. 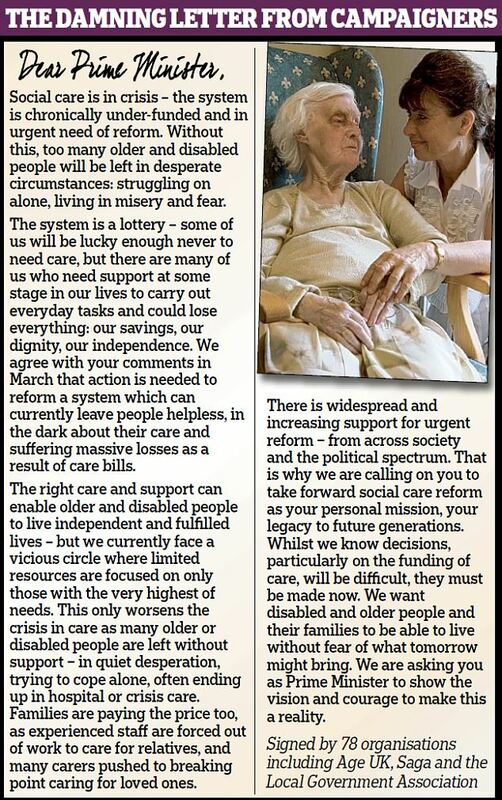 These are crucial services which have allowed many people to continue to live independently, and loss of this independence will come at a cost to us all. Caring, admirable people who are working in the care sector for low wages face further cuts. It is only about a year ago that there was an uproar about a private company called Southern Cross which, having privatised a chain of Care homes for the elderly, went into receivership and a host of Care Homes had to close. 10) But regardless, the government relentlessly pursues its programme of privatisation of public services, and elderly care is targeted, along with everything else we value, including state education and health. Across the country, care homes are privatised, despite the inevitability of a decline in standards. The Guardian 3) reports: The Equality and Human Rights Commission’s report last month found that council-funded home care provided to elderly people was, in some cases, in breach of the European Convention on Human Rights. Many people were surprised at the report’s findings. But not me. It was the wholly unsurprising outcome of the wholesale transfer of care homes out of local authority care and into the private sector. The council may have funded the care, but they were not responsible for actually providing it. It was consumerism meets care head on and no one could be in any doubt as to who the victor would be. It is totally immoral that caring for people should be a source of profit. It’s just plain wrong. When we are young we pay taxes to care for our futures. Today’s elderly people did so during their working lives – they did not make those contributions so the financial sector can make profits to line the coffers and top up hedge funds. This is theft. The “granny tax” (4) was the biggest revenue-raising measure in the budget. Some four million pensioners over 65 will have their personal tax allowances frozen. This is another cynical attempt to make cuts at the expense of ordinary people, in a budget which saw the cuts in corporation tax – a budget for the wealthy. The chancellor’s austerity policy is not working, We continually people suffer cuts to their living standards and all because of Osborne’s obsession with a deficit caused by bankers – not ordinary people who have already paid taxes all their working lives and now hope for a comfortable retirement. It is most unfair! The NPC says it has been inundated by complaints from pensioners that those on modest incomes will have to contribute more, while people earning more than £150,000 a year will see their top rate of tax cut from 50p to 45p. It says there is a perception that pensioners are being asked to bail out the super rich, which is unfair. Labour has released figures suggesting that “well over half” of the pensioners affected by the tax have incomes far below the average taxpayer, in spite of the government’s claim that the better-off will shoulder the burden. The arguments are shallow, contradictory and transparent. The state pension age has been raised with the expectations that everyone is now expected to work longer. There are many, many people who love to work, are fit and want to continue, and that is wonderful. Others feel they are ready to enjoy the later years in life, which is why they paid for pensions, only to find someone changed the rules, and the pensions have been hijacked. We have heard all their excuses that “we are living longer”, so “we can’t afford to give you the pensions you paid for, or the health service you paid for and the elderly care, which you paid for. It’s no joke to have struggled all your life and then see your assets stolen for private profit. It might be a joke to some, a comedy show as they cry, “Carry on Working” , despite a million young people looking for work, and being forced onto dole queues. All of this demonstrates how the Coalition abuses its power. The electorate remember Thatcher and the nasty party. Labour must show that there is an alternative. The electorate may forgive New Labour’s courtship with neoliberalism which opened the way for the Coalition to privatise our services. The electorate needs to see Labour showing it is the caring party it was set up to be, developing policies for recovery which will invest in all of our people provide fair pensions for all, and develop a National Care Service. Labour must demonstrate its priorities are for people and not for profit. Actions speak louder than words. 7. Think Left -Pensions – Public and Private Sectors – Unite! This entry was posted in Economics, Employment, Health, Housing, Topical News and tagged elderly care, granny tax, pensions, public sector, southern cross by Pamplemousse. Bookmark the permalink. Well we have to remember history they state so we do not do the same mistakes. We all remember Labour mistakes and they did repeat them, Labour as we remember came out in what was going to be a bright new world and we saw Labours first action was a 75p rise in pensions and benefits, which made age concern become political active this scared labour into offering of course heating allowance. We saw Labour state that DLA should not be paid to people over retirement age, because it was wasted. Labour were in fact a Thatcherite party with Tony Blair and Gordon Brown only giving the poor the disabled the elderly anything if they thought they had to . It was Labour that allowed the abuse at the private homes which saw the disabled treated so badly, they just ignored it, it was Labour that brought in welfare reforms. Yes I know we now have the Tories who are basically carrying on, do not forget the new benefits regime that are coming in a new monthly benefits paid out over the internet the new so called universal benefits has been backed by Labour. The problem is for people is seeing a difference between the parties if your elderly poor sick or disabled. And sadly we have no difference, bankers caused the recession, it’s the poorest who are paying for it. ‘ bankers caused the recession, it’s the poorest who are paying for it.’ Very true. New Labour certainly did continue Thatcherism but we must hope that Ed Miliband meant a great deal when he removed the ‘New’ label and reverted back to the LP. However, he doesn’t need to move very far to be better than the present economy-wrecking nasty parties. Hype if New labour is dead then sadly somebody needs to end it’s life, sadly it’s more alive now then before. But ok New labour is dead now prove it tell us your direction, is it to the right, to the left, not in the middle for god sake. Robert – I am no apologist for New Labour. I have opposed and argued against their tory-lite policies since 1994 when Tony Blair was first elected. However, there needs to be a focus on removing the most vicious government of my life-time .. more extreme even than Thatcher. I very much doubt that the LP of Ed Miliband is going to be perfect although he has hinted at some surprisingly positive moves. We need to be ‘real’. There is no other way to remove this government except by the return of a Labour government. In the meantime, those within and without the LP should keep up the pressure and arguments for the LP to become a left-wing party. The danger is that by focusing on the sins of the New Labour past and what is lacking now, we allow another 5 years of Tory/LD coalition whose aim is to return us to the working conditions of Victorian England. IMO fighting this government has to be the priority. We all have our views my local labour party is now joining another labour party in another area as it did not have enough members to form a meeting. I think some area of the country would be voting for labour because it’s seen as being well slightly better then the Tories , myself I have yet to see the differences. Then again I’m disabled maybe I’ve a mental health issue when it comes to socialism, but my Labour party card did start in 1963. I’m going through the Labour parties medical the WCA for the sick and the disabled, I won mine six months ago but have been called up again, may be they think it was wrong or maybe ATOS is not rich enough. Anyway good luck with your hopes, mine are dead. Robert, I understand your feeling of hopelessness. Last night I heard an elderly gentleman speak. His name is Tony Benn. He has never given up hope, nor wavered in belief. It struck me that he said be sceptical of politicians, but never cynical, because that is negative and will achieve nothing. So we must keep hoping, keep encouraging others, and never give up. He spoke of Ed Miliband as a man of integrity, and said New Labour is dead. His advice – say what you mean and mean what you say. That is advice we should all live by. I have sat next to Mr Benn at Conference, we also went to the fringe meetings, sadly Tony has changed his views over the years which I suppose it’s what we all do. As for Miliband sorry cannot stand the bloke, he is what I call a career politician of the worse kind and I warned my Union at a meeting the GMB it would be a mistake to back him, they did and now we are running around discussing funding cuts or political colleges while the members are demanding no less then disaffiliation. Skeptical of course we are skeptical of course we are skeptical of a bloke who has done nothing in life has millions in the bank and demands cuts to the poor , no thanks. I can’t agree with all of your comments , Robert yet I understand your despair. I do acknowledge the damage New Labour did, but we must put that behind us. It is sad that we were so desperate to regain power after Thatcher that witnessed a kidnapped party which no longer represented the people. But that time has gone, we must ensure that it has gone. Nothing will be achieved by negativity, cynicism and inactivity. Nothing will be achieved by splits in the Left. We need to get behind Ed Miliband and fight this Coalition government, not each other.